Why Hike to Dewey, Crocker, and/or Stanford Points? Dewey Point has fantastic views looking down onto Yosemite Valley, especially El Capitan. Once you've reached Dewey Point, it's only half a mile or so farther to Crocker Point, which adds views of Bridalveil Fall, and from there, it would be foolish not to proceed on to Stanford Point, another 0.7 miles (1.1 km) ahead. In fact, once you've adopted this attitude, you'll soon find yourself at the Tunnel View in Yosemite Valley, trying to hitch a ride back to your car. And you get McGurk Meadow for no additional cost. Best Time to Visit: Whenever the Glacier Point Road is open, which generally means June through October. If you're continuing past Dewey Point to Crocker or Stanford Points and their views of Bridalveil Fall, the earlier the better for maximum water flow. Crowd Factor: Light. This hike is long enough to weed out the flabby sort of tourists who'll hold up traffic at the grocery store just to get a parking spot thirty feet closer to the store entrance. (Not that I have strong opinions on that particular artery-hardening habit.) If there are secluded views over the rim of Yosemite Valley to be had on the day you're hiking, this is where you'll find them - particularly at Crocker and Stanford Points. Difficulty: Medium. There's not a lot of climbing, but it's a long walk. Parking: There's no lot, but you can park along the shoulder of Glacier Point Road a hundred meters or so past the trailhead. Nearest Bathrooms: There's a lone outhouse at Summit Meadow, a mile west. You can find bathrooms extravagantly appointed with plumbed toilets and sinks and even electric lights at Chinquapin, the Glacier Point Road's origin, 7.5 miles (12 km) to the west. Nearest Snacks: at the Glacier Point Road terminus, 8 miles (12.8 km) farther down the road. 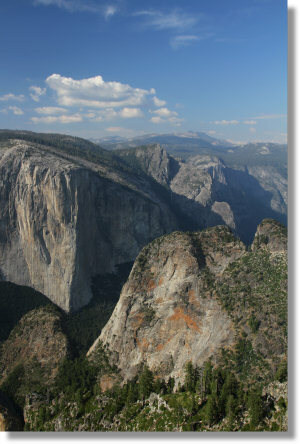 Getting There: From the South entrance to Yosemite, turn left and travel 17.3 miles (28 km) to Glacier Point Road. From the valley, take road 41 nine miles (14.5 km) to the same road. Once you're on Glacier Point Road, follow it to the trailhead 7.6 miles (12 km) later; look for a sign pointing to "McGurk Meadow". In the winter, the park service removes this sign to confuse the bears. Take the trail on the north side of the road; the southside trail goes to Westfall Meadow. Here's a Google Street View panorama of the trailhead area. Already been to Dewey Point? Add a Review.